The Diamondbacks have added a big bat to the middle of their lineup, swinging a trade for slugging outfielder J.D. Martinez. In exchange for Martinez’s services, the Arizona sent Detroit a trio of minor-league infielders: Dawel Lugo, Sergio Alcantara and Jose King. I do not have a KATOH projection for Jose King, as all but 13 of his professional games have taken place in the Dominican. However, he signed for a mere $75,000 and didn’t even make the honorable-mention section of Eric Longenhagen’s Diamondbacks list. That tells you about all you need to know: he’s a low-probability lottery ticket. Below are the projections for the other two players whom the Tigers receive. WAR figures account for the player’s first six major-league seasons. KATOH denotes the stats-only version of the projection system, while KATOH+ denotes the methodology that includes a player’s prospect rankings. Of the prospects headed to the Tigers, Lugo is the closest to the big leagues and is also the most promising. He’s spent all of 2017 at the Double-A level, where he’s hit a respectable .282/.325/.426. He hit a more impressive .311/.339/.492 last year between High-A and Double-A. Lugo makes a lot of contact while also hitting for a fair amount of power. Players who can do both of those things from a semi-premium position aren’t all that common. That’s about where Lugo’s appeal ends, however. He rarely walks and is a non-factor on the basepaths. Despite having played shortstop, Lugo’s defense per Clay Davenport’s numbers place him a tick below-average at third, which jibes with Eric’s 40/45 fielding grade. 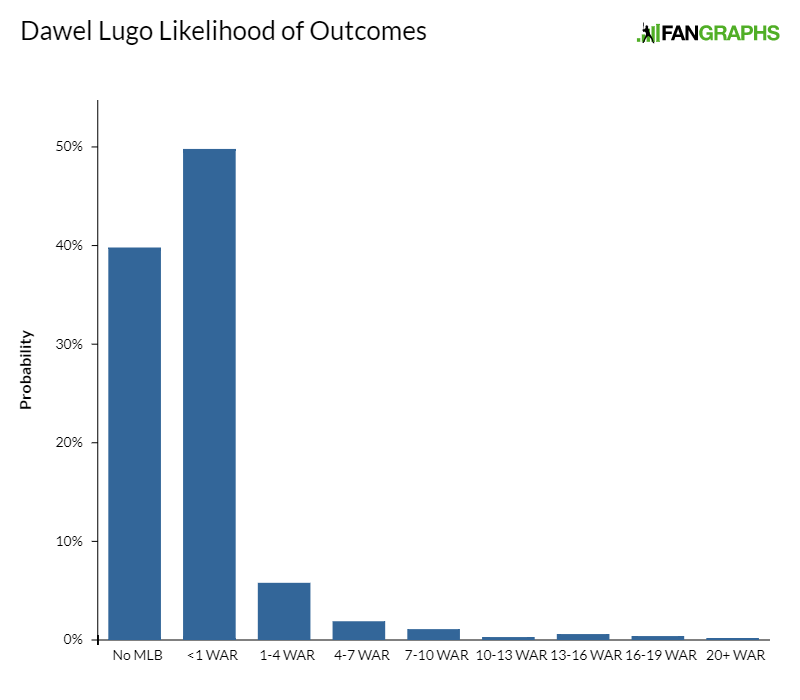 Lugo is still just 22, but as someone who signed out of the Dominican several years ago, he’s unlikely to make any wholesale improvements at this point. Still, someone with his offensive skill set who can play a passable third base could be of some use in the near future. To put some faces to Lugo’s statistical profile, let’s generate some statistical comps. I calculated a Mahalanobis distance between Lugo’s Double-A performance and every season since 1991. In the table below, you’ll find the 10 most similar seasons, ranked from most to least similar. The WAR totals refer to each player’s first six seasons in the major leagues. Please note that the Mahalanobis analysis is separate from KATOH. KATOH relies on macro-level trends, rather than comps. The fates of a few statistically similar players shouldn’t be used to draw sweeping conclusions about a prospect’s future. For this reason, I recommend using a player’s KATOH forecast to assess his future potential. The comps give us some interesting names that sometimes feel spot-on, but they’re mostly just there for fun. A switch-hitting shortstop, Alcantara has played at the High-A level exclusively this year, hitting .279/.344/.362 with 11 steals. He does a decent job of controlling the strike zone, as evidenced by his 9% walk rate and 15% strikeout rate, but offers little else offensively. He’s never hit for even a modicum of power, and at 5-foot-9, that’s unlikely to change. 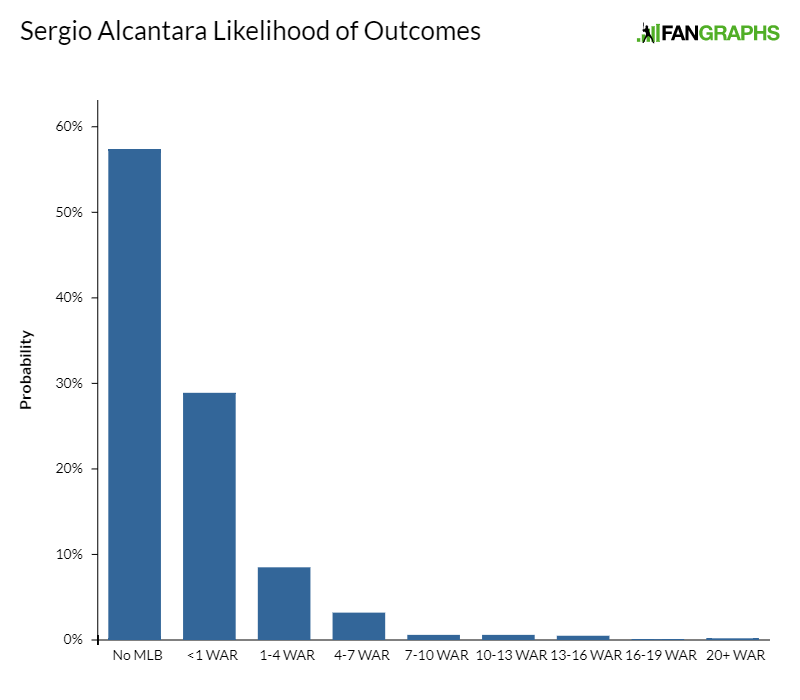 Alcantara has a 70 arm, is an above-average runner and plays an adequate defensive shortstop. Even a average defensive shortstops needn’t hit much to play in the big leagues, so it’s easy to envision Alcantara sticking as a glove-first utility player. However, KATOH is highly skeptical due to his size, weak hitting, and distance from the majors. We hoped you liked reading Projecting the Prospects in the J.D. Martinez Trade by Chris Mitchell! Would the Tigers have been better off just taking the draft compensation they would have received than trading for these fringe prospects? The Tigers are not interested in having good prospects. A 4th round comp pick? Meh. Because they are over the luxury tax again, it would have only been a 4th round pick.